As a result, reducing one increases the other. 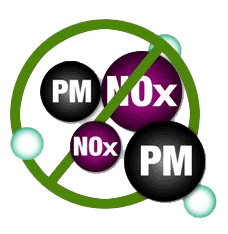 If the engine is tuned to reduce NOx at the source, combustion temperatures will be lower, resulting in higher PM levels. An after-treatment diesel particulate filter (DPF) system lowers PM. If the engine is tuned for maximum efficiency, combustion temperatures will be high, resulting in low PM and high NOx levels. These can be broken down in an after-treatment system using a diesel exhaust fluid (DEF) additive combined with a catalyst.